I’m posting about stuff that happened more than a week ago, so i’ll start by apologizing to any readers who might have come here looking for up-to-date developments. To explain briefly, party-approved waves of media sensationalism, the Chinese public’s reaction to them, and the regime’s reactions to those public reactions, are crucial aspects of my research project, so my task is to document these in as much detail as i can. The PRC’s yearly South China Sea fishing ban, which started last week, has offered a much-needed circuit-breaker to ease the tensions, but even now that the wave has broken and rolled back, i still have a backlog of interesting conversations to discuss. On Friday (May 11), as PRC-Philippines tensions eased with the reopening of diplomatic dialogue, the emphasis of Chinese media was very much on the small size of the touted “anti-Chinese” protests in Manila. 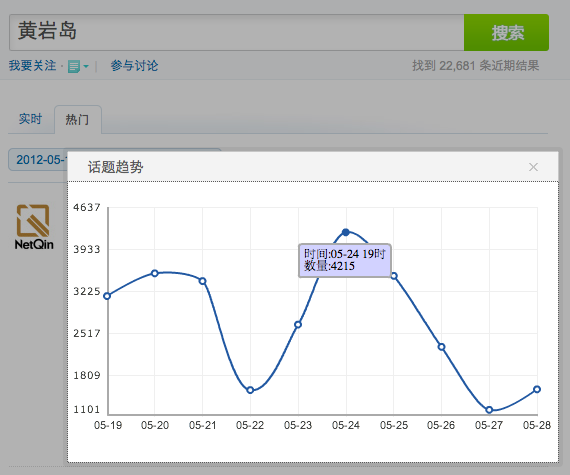 But they were positively huge compared with the protests in Beijing the same day. Phoenix’s Manila correspondent described the scale of the Manila protests as being “far from the scale the Philippine side had previously said”. 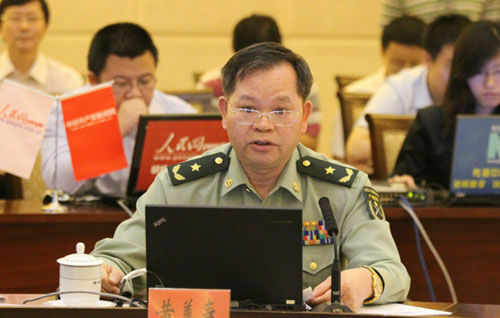 However, many other media, including the official CNS news agency, specifically contrasted the small gatherings with the PRC Foreign Ministry’s ominous warnings. After noting the arrest of a protester in Manila who tried to burn the Chinese flag, the short CNS report also carried, in its second paragraph, the Philippines government’s comment that the protests were initiated by ordinary people and were not encouraged by the government. Other reports also emphasised the non-official (“民间”) nature of the protests, which also contrasted with the continuous official rhetoric accusing the Philippines government of whipping up anti-Chinese sentiment. But the NetEase comment thread on “Arrests for trying to burn Chinese flag” was full of wild rumours, stated as fact, of Chinese casualties in Manila — complete with shops torched and deaths in the dozens. The third comment suggests why the top two comments were so popular, and why the Chinese government has to sometimes take drastic action to curb rumours: when people start really caring about an issue, one of their first instincts is to disbelieve whatever the official media says. If the regime knew about these explosive rumours doing the rounds, however, it appears to have seen them as useful rather than harmful. Like the calls for human-flesh searches in previous days, they were not censored, and in fact they remain in place today, six days later. But if the online-commenting public had been given carte blanche for their outrage, the same privileges certainly did not extend to the real-world public. At the Philippines’ embassy in Beijing, a handful of patriotic Beijing residents actually stared down the heavy policy presence to attempt to inform the Philippines that Huangyan Island belongs to China. On North Xiushui Rd, where the Philippines embassy is, there were a certain number of police vehicles parked and four or five police officers on duty. A few men came and protested in front of the embassy. 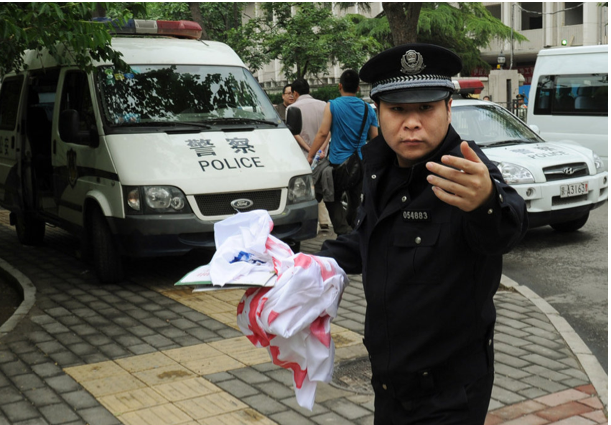 One male wearing a shirt with, “Protect Huangyan, diplay our country’s prestige,” written on it. 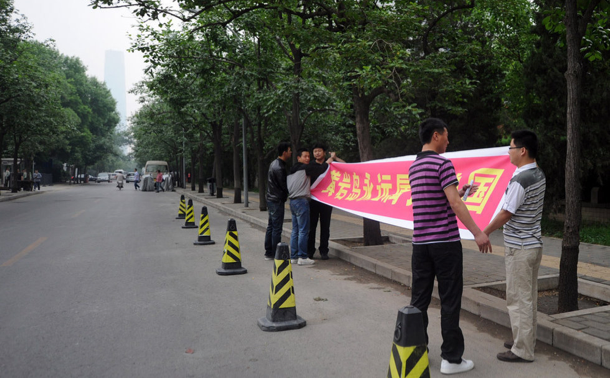 He unfurled a banner with his fellows that read, “Huangyan is China’s historic territory, do not challenge China’s bottom line,” on one side and, “When one can restrain no more, one cannot keep restraint, 忍无可忍不会再忍” on the other. 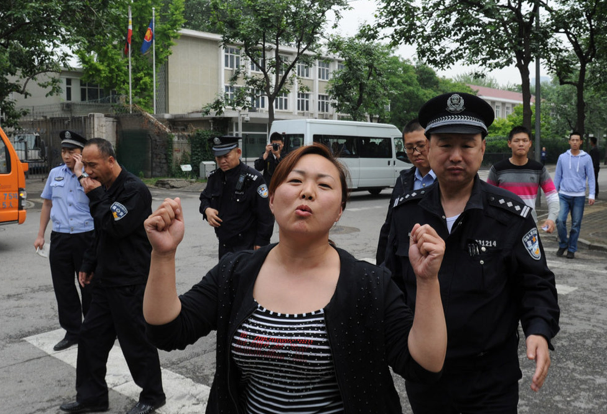 Around 3.30 a male surnamed Li was preparing to protest when an embassy car drove in. 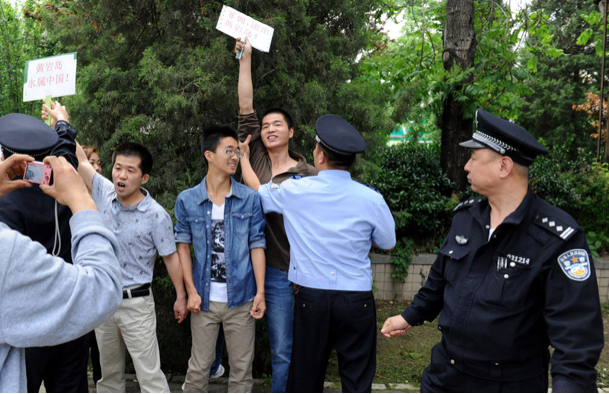 Standing across from the main gate, he immediately pulled out and raised high a white paper sign with the slogan, “Love China, Love Huangyan,” written on it. This report was certainly not widely publicised; it’s been deleted from the CRI website, and NetEase has done the same to its version. 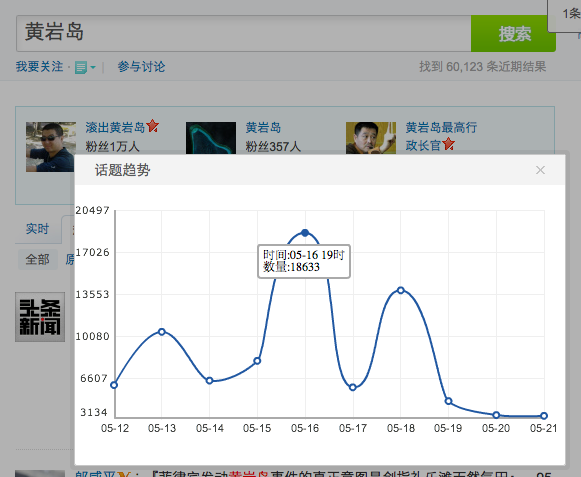 On Saturday morning 21cn posted a stub and the full article was posted on Phoenix, where it remains available, but it hasn’t been given any prominence at all judging by the mere 300 or so participants on its heavily-censored comments thread. On the Huangyan Island issue the Philippines has incited its people’s emotions and encouraged its domestic and overseas populations to launch demonstrations aimed at China. But the Philippines’ actions have certainly not caused the Chinese masses any great worry, and there were definitely no large-scale gatherings at the Philippines’ embassy in Beijing to oppose its unjustifiable conduct, [just] sporadic protests by the masses. It would probably have been more accurate to say that the Chinese government’s campaign to focus media attention and public anger on the issue, and its dire official warnings about large-scale anti-Chinese protests, have not caused large-scale gatherings. With a leadership transition just around the corner it is unlikely that the regime would want to see any kind of street protest anywhere, least of all in Beijing. It could just be my skepticism about the degree to which Chinese people care about the South China Sea issue (for a fascinating individual case-study that vividly illustrates why, read the “Confessions of a patriot-used-to-be”), but surely the security forces must have been expecting a bit more than this feeble show of patriotism. Maybe most people who might have protested just knew better than to try in 2012. Photos found here. 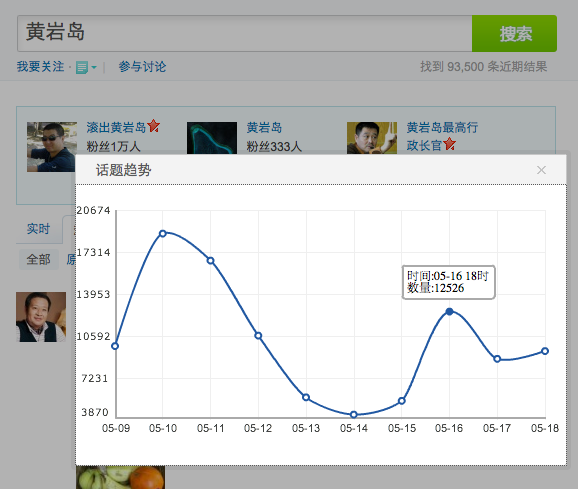 That doesn’t mean the Chinese public, particularly the public when reading news and interacting online, did not or does not care about the Huangyan issue. I’m really just stating the obvious: that all the media attention and anger online has failed to translate into offline protest. But the internet’s systems of collective expression amplify extreme voices, while at the same time its anonymity can also prompt people’s voices to become more extreme. The question i’m left with is: was the feebleness of this protest, in particular the fact that so few even tried to make their outrage heard, the result of government suppression, a reflection of Chinese people’s knowledge of the cycles of CCP politics, or is it just the result of not enough people actually caring? It’s still early days, but my money would be on the latter. If my hunch is right, then the government will struggle to credibly play the audience-costs nationalism card on this issue because for that strategy to work, CCP China must convince its international adversaries that it genuinely beholden to public pressure. In the case of Scarborough Shoal, it has demonstrated just the opposite. Whatever doubts i might have had regarding the effectiveness of the CCP’s campaign to focus Chinese people’s attention on the Scarborough Shoal standoff, they had disappeared by Thursday (May 10), when several Chinese friends here in Perth, Australia — whose usual attitude towards the South China Sea disputes ranges from tolerance-of-my-babblings to complete lack of interest — actively contacted me to say they thought China was about to go to war with the Philippines. Thursday was probably the day the multimedia swell on Scarborough Shoal peaked, but the mechanics giving rise to it were in motion the evening before. Foreign Ministry spokesman Hong Lei had already taken the encouragement of public outrage to a new level on his Wednesday afternoon press conference when he stated that the Philippines’ behaviour had “triggered strong reaction and concerns from the Chinese people at home and abroad”. Now if they use force to remove our sovereignty markers, that is taking violent action, and we have the right to take equivalent action. As far as i can tell, both of these serious-sounding provocations by the Philippines are non-stories. First, the Philippines has not renamed Scarborough Shoal — it still officially refers the feature as Bajo de Masinloc (and has certainly never called it Huangyan Island). Second, as the Sohu photo tour translated here a couple of weeks ago clearly shows, there are no sovereignty markers on Huangyan for the Philippines to remove. Late on May 9 the Huanqiu Shibaoreleased a report on Philippines Defense Secretary Voltaire Gazmin’s May 9 comment that he he had interpreted remarks made by Hillary Clinton during the 2+2 meeting on April 30 as indicating the US would protect the Philippines from any attack in the South China Sea. After being reposted on the People’s Daily’s website (with Gazmin wrongly referred to as “Foreign Minister” 外长), this became a prominent headline on the front pages of all 5 news portals on May 10. Contrary to at least one western analyst’s claim, among all the inflammatory coverage there was actually little in the way of official criticism of the US — hardly surprising given Defense Minister Liang Guanglie was on an official visit Washington. In fact, the official media gave plenty of play to the idea that America had refused the Philippines’ requests to step in, an approach that might well have been intended to make Chinese military action appear more feasible. 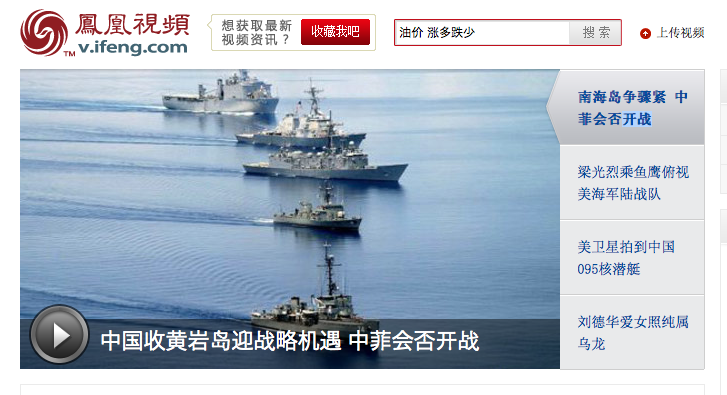 The Phoenix online video site was particularly enthused, leading with “China meets opportunity to retake Huangyan Island: will China and Philippines go to war?”. Phoenix Online Video lead story, May 10, 2012: China meets opportunity to retake Huangyan Island, will the Philippines and China go to war? I frequently saw and heard the line that “the US is maintaining a neutral stance” on Chinese TV and radio on May 9 and 10, and the PLA Daily stated that “even [the Philippines’] backers are not convinced” of its claims. (Here are some English-language examples from Xinhua and the China Daily.) 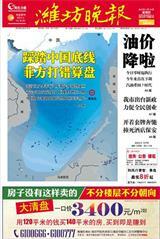 On May 10 NetEase chose to include “America refuses to take sides on Huangyan Island issue” on its front page, just below the main headline linking to Gazmin’s comments, “Philippines: US guarantees Philippines will not suffer any attack in the South China Sea“. While Liang’s visit and the need to downplay the Philippines’ international backing probably dictated that the US connection had to be largely limited to online media, the offline media nonetheless had plenty of material to work with. 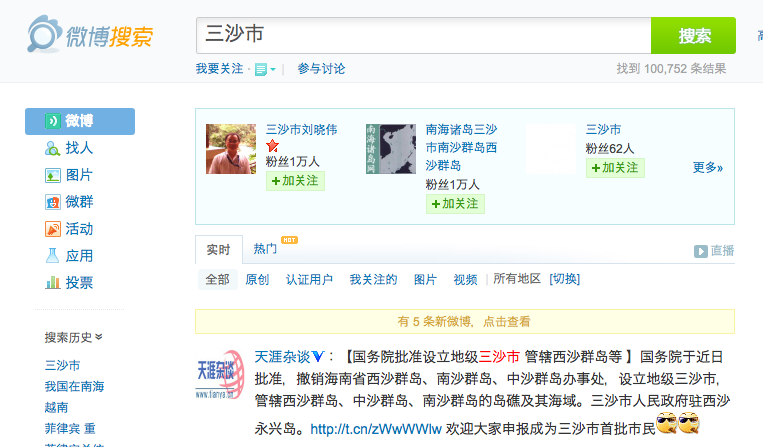 And judging by the apparent injunction to promote Huangyan-related reports, they needed it. 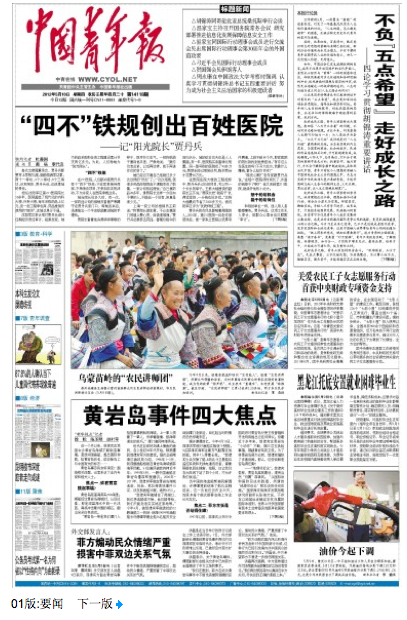 The May 10 China Youth Daily‘s front page headlines included “Four points about the Huangyan Island incident” and “Philippines incites population’s emotions, seriously harming bilateral relations”. The Beijing Morning News had “Overseas Filipinos to hold anti-Chinese rally on May 11” and “Hard to be optimistic on Huangyan Island incident: China claims to have made all preparations”. Huangyan even made the front page of the apparently (i’ve never read it) entertainment-focused Beijing Star Daily (北京娱乐信报), which led with, “Philippine newspaper article says Huangyan Island indeed belongs to China”. 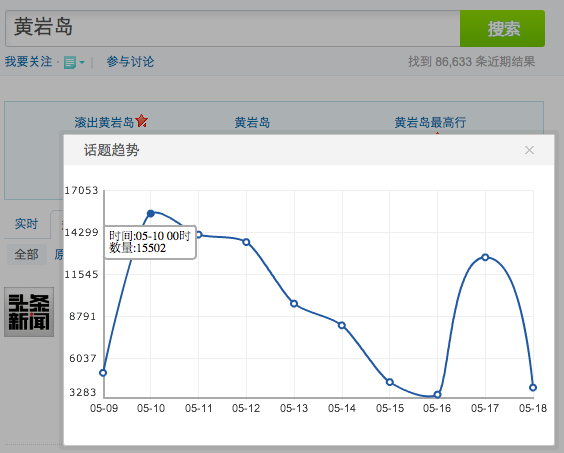 Many, possibly even a majority, of the regional papers had the issue on their front pages too, including the Southeastern Business Daily 东南商报, City Evening News 城市晚报, the Chutian Metropolitan News 楚天都市报, and the Chuncheng Evening News 春城晚报 (those examples were obtained just by glancing through the Bs and Cs on ABBao). Shandong’s Weifang Evening News (Shandong) had one of the more dramatic splashes. 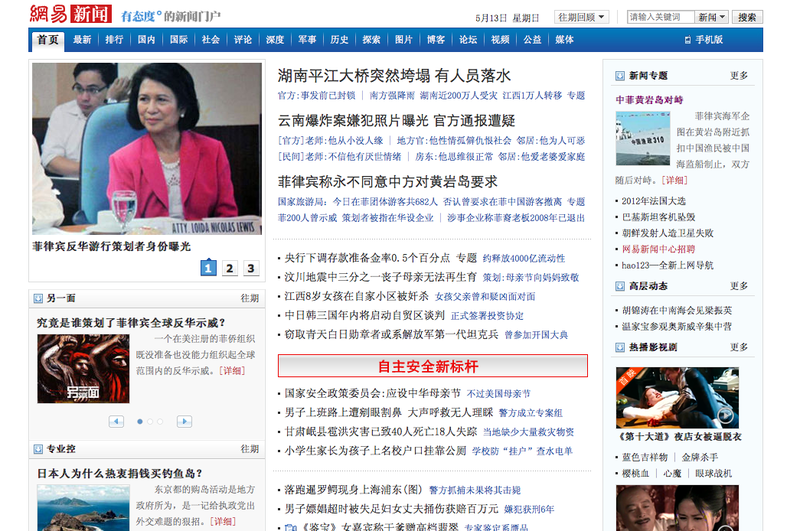 The yellow headline reads “Trampling over China’s bottom line, Philippines miscalculates”. The People’s Daily had a page 3 commentary, synthesizing most of the recent official Chinese comments, talking up the Philippines’ provocations (including the apocryphal renaming and removal of sovereignty markers). But most importantly of all, the People’s Liberation Army Daily came to the party with a foreboding piece that called Scarborough Shoal “an issue of territorial integrity, national dignity and even social stability“. Social stability is of course official code for popular protest (or lack thereof), so the implication was that China could be forced to attack the Philippines because the Chinese people are so angry. The latter comment was deleted sometime between Friday and today. Why? Hard to say, given its only difference with the comments elsewhere was that it was more entertaining and better-written. Actually that could be one possible explanation. More seriously, though, one clue may be the general lack of “treasure the memory of Chairman Mao”-type comments in comment threads of late. They were absolutely dominant last year. If the portals have indeed received instructions to reduce Maoism in the public discourse on this issue, that would support Jeremy Goldkorn’s suggestion that the Scarborough Shoal media frenzy has been an attempt to shift public attention away from domestic politics and the Bo Xilai affair. That explanation is quite compatible with the one repeatedly put forward here, namely that the leadership is promoting domestic expressions of outrage, including criticism of its own stance as weak, in order to improve its position at the international negotiating table……something about two birds, one stone……single arrow, pair of eagles……etc. The Chinese ruling party is good at that. 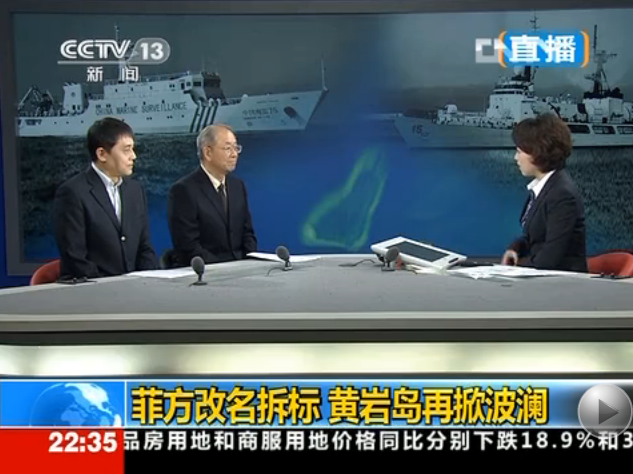 CCTV Nightly News 《晚间新闻》, 9 May, 2012. “The Chinese side has also made all preparations to respond to any escalation of the situation by the Philippine side,” Madam Fu said, according to the MFA. Although this was interpreted in some quarters (the WSJ’s headline-writing quarters at least) as signaling a hardline shift, the comment threads on the story on Phoenix and NetEase suggested that the Chinese online audience wasn’t buying it. Yet. However, over the following couple of days a wave of hardline commentary and inflammatory coverage appeared to raise the hopes of those who, not to put too finer point on it, want China to start a war over Scarborough Shoal. According to a detailed survey conducted in late April by the Huanqiu Shibao‘s opinion polling centre (and widely publicised in the Chinese media, e.g. here), that describes almost 80% of the urban Chinese population. We certainly shouldn’t take that result literally, for the survey was full of leading questions, probably because that’s the result it was designed to find. The majority of the population are, i suspect, quite apathetic, but the number strongly in favour of military action is definitely significant, if only because it’s China, where every percent of the population is 13 million people.